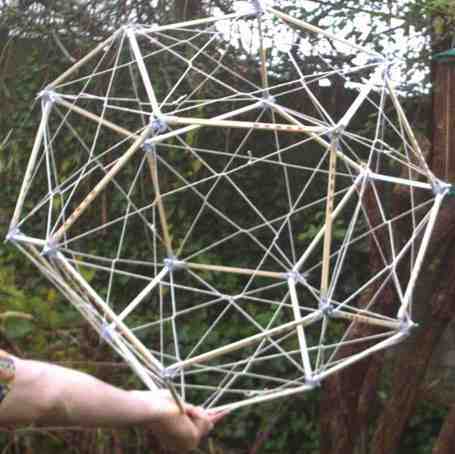 Tim Tyler is a highly original thinker with long experience in geodesic and tensegrity structures. Tyler works as a computer programmer and consultant with a broad interest in man-machine interfaces, robots and synthetic minds. He is also a yoga student interested in Tai Chi, massage, and dietary energy restriction. Tyler's Springie is a Java 1.1 tensegrity simulator using Java, VRML and POV Ray. See Online Applications. Tyler promotes a form of tensegrity where an external tension web is woven around the compression struts. He claims that this is "a new approach to stabilising domes based on an external structural shell consisting of a hexagon-pentagon tesselation - using the principles of tensegrity." In this arrangement the tension elements replace inner stabilizing struts. "The stabilising components do not need to support compressive forces to do their job effectively. Use of tension elements can have cost and weight advantages - since breaking strains are often dramatically higher than buckling stresses in materials of equivalent weight or cost." Tim Tyler Dodecahedron. The tension net is external. Video lectures by Tyler: 130 lectures are hosted here, https://www.youtube.com/user/tmtyler/videos. Though none directly address tensegrity, they discuss a broad range of topics such as AI, cyborgs and superintelligence; Against the singularity; Memes and Memetics; and Evolution and Darwinism. This page was last edited on 3 December 2018, at 17:32.